In today’busy world, its very important to keep yourself completely fit and healthy because any dullness, weekness or lethargy means so much disturbance in daily schedules along with added pressures later. So its highly important for all of us to keep ourselves ready to protect from daily dieases with a strong immune system which comes with daily intake of proper amount of nutritious food. But its not easy to complete your daily intake of nutrients through food, specially if you are a vegetarian. For this problem, this Zenith Nutrition brings a very easy solution in form of Zenith Nutrition Resveratrol Plus Vegcaps. Perhaps the most notable producer of resveratrol is the grapevine, which produces large amounts of resveratrol in the skins of grapes to protect against fungal diseases and sun damage. It is therefore no suprise that wine (in particular red wine - which is fermented with grape skins) has some of the highest levels of resveratrol out of any natural food. • Standardized to contain no less than 100 mg. of the Resveratrol. PRICE - Rs 1200/- for 60 Veg Capsules. Indication : Cardio protective, Angina, Anti Oxidant. Directions: For persons over the age of 10 years take one capsule in the morning with food or as directed by physician. 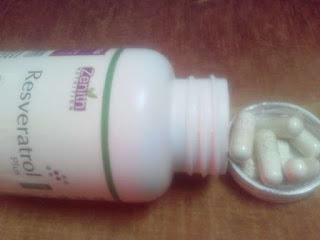 This Resveratrol supplement from Zenith comes in the regular white jar packaging which is simple yet convenient to use. 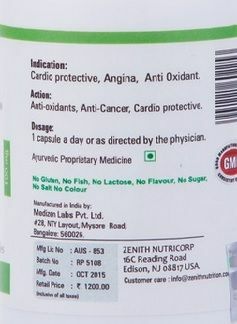 These capsules are great health supplements for those suffering frequently with health issues specially related to heart since these capsules are great source of anti oxidants, anti cancer and work as cardio protectors. The two most important ingredients which makes this capsules a great health supplement are Grape Skin Extract and Piperine and its quite difficult to include these two in your daily diets. So this is where this Resveratrol comes is use and the best part is its a high quality vegan supplement free from artificial colors and preservatives. This is a super anti oxidant capsule to fight with several diseases and increase your immunity power to keep your entire system protected. Though these are completely safe, but do consult your doctor in case of any doubts or queries. Disclaimer: There are no guarantees that every person using this product / service will see the expected results for sure. Results depend on a lot of factors and the results may vary from person to person. 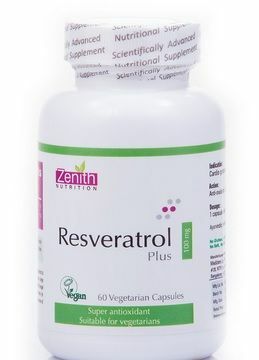 Organic health supplement Resveratrol from Zenith. Super antioxidant to fight with diseases naturally. Anti oxidant, anti cancer and cardio protective. Completely vegan and without artificial colors. Its nice to use this supplement, becoz resveratrol grape skin, its extraction almost use very specifically to our healthy life...let me try and use, thank u for this review! great! it seems great reviews! i will sure recommend to all my well wishers, thanks to zenirth nutrition site!